Home » News » Megalithic Riff Lords Monolord Return With New Video! Gothenburg trio Monolord have shared the title track and details of their highly anticipated third album, titled Rust. 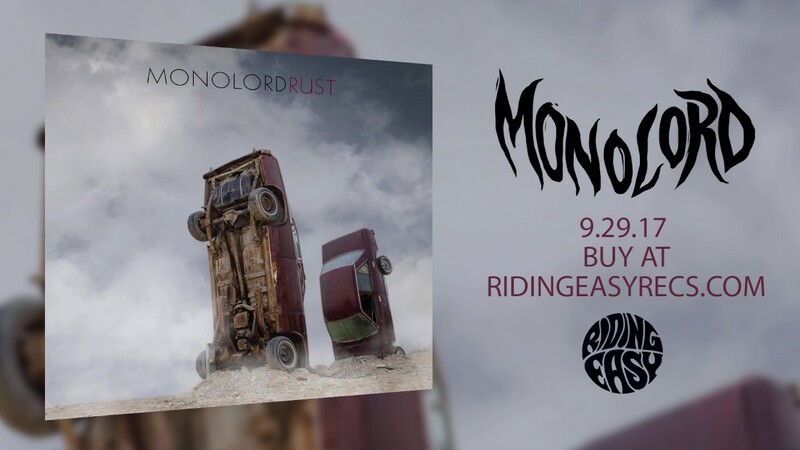 Featuring John Gamino (Mondo Drag) on keyboards and Trevor Church (Beastmaker) who provides the sterling outdo guitar solo, “Rust” is a monolithic riff assault…..
Monolord are a rare breed; a band both encompassing and transcending genre, a vortex of heavy rock density that consumes all others. Their thunderous, tuneful heft has built a rabid international fanbase in short order since their 2014 debut. But Rust, the band’s third full length, truly exemplifies why some refer to them as the Nirvana of doom. Willems says: “Album opener “Where Death Meets the Sea” perfectly exemplifies their mastery of dynamics and hooks with a driving, infectious buzzsaw riff that lesser bands would ride off into the sunset, but Monolord uses subtly to spur the song’s skull rattling rhythmic core ever onward. Jäger’s watery vocals glide over ominously building verses that erupt with the song’s insistent refrain. Monolord will join UK doom trio Conan on a gargantuan co-headline 21 date roll over the Continent. Starting at the Soulcrusher Festival in Nijmegen, Holland on October 7, 2017 it takes in France, Spain, Belgium, Denmark, Czech Republic, Austria, Switzerland and Italy before winding up twent-one days later in Siegen, Gemany. A HUGE sonic tapestry of sinuous, almost ambient, stoner rock riffing! Welcome to the New Wave of Heavy Psychedelic Space Rock!